A "Fully Vegan" sign caught my eye as I was walking down Swanston Street. It seems there is a new vegan restaurant in town so I could not wait to try it out. The Shanghai influenced menu is several pages long so it's hard to pick with all the choices. Cold starters are a speciality and I was keen to sample so we tried the cold WonTon. Delicious. 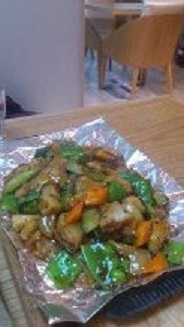 The menu includes soups, a wide variety of mock meats and fish, dumplings, bean curd, vegetable dishes, rice and noodles. 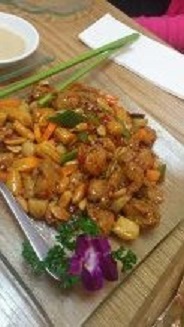 The sautéed vegetarian chicken with nuts and hot and spicy sauce was a favourite. I was not so keen on the mushrooms, a little slimy. 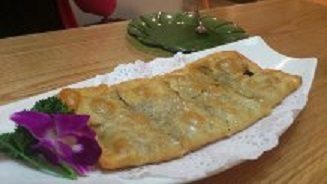 And not one to resist a dessert, I ordered the red bean pancake. A very generous serving of 8 slices arrived. Gong de Lin is slightly more expensive than the neighbouring Asian restaurants on Swanston Street. However, the service is friendly and quick, it is a clean and well-presented restaurant and you can easily share the dishes given the large portion sizes. Vegans note that the ice cream is dairy. My only criticism, since Gong de Lin is described as fully vegan. Maybe this will change and I can get the banana fritter and soy ice cream next time. I live in hope.